Use this page to learn how to open server and local databases, how to use the various windows in Axisbase, what is an Axis ID, and how password security works. An Axisbase database is contained in one file, with the ending ".axis1". An Axisbase database has an "Axis ID" which is an uppercase word and does not have to be the same as the file name, and is usually not related to the line of business. The Axis ID is used to distinguish multiple databases when they are open at the same time. Examples: DAISY, SATURN, FOX. A database can be open directly by Axisbase on your workstation, and while it is open, the file is locked and no other users can open it. This is referred to as single-user mode, or opening a database file. 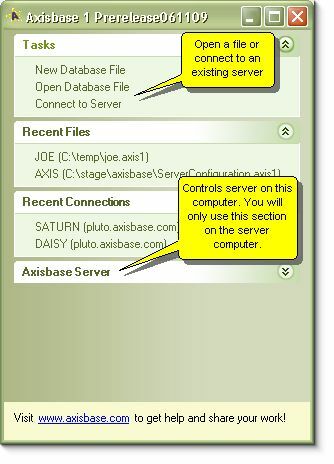 Alternately, a database can be served by the Axisbase server (a background process which is included with every installation). When the server opens the file, the file is locked and no other process can open it. However, any number of workstations can connect to the server. This is referred to as multi-user mode, or opening a connection. A client/server application is one that involves two software programs: the server software is the unattended background process that usually runs on a server computer. (The term "server" can refer to both hardware and software.) The client software is the program you use on a workstation that displays windows. Scenario of opening a file over a local network: In this case, you access the file on a company server by a share name such as "\\serv1\data\myfile.axis1", or a mapped drive letter, such as "Z:\myfile.axis1". Only one workstation can open the file at a time. Server scenario: In this case, one computer acts as a database server, and the workstations connect to the server process, instead of directly to the file. Any number of workstations can connect at the same time. The main purpose of the launchpad is to remember recent files and connections that you have opened, and allow you to create and open new files, and make new connections. It also controls the database server (see below). Click once on any recent file or connection to re-open it. Click "Open Database File" to open a file in single user mode. Click "Connect to Server" to open a connection in multi-user mode. The user name "super" automatically has full rights to a database, so you should guard the password for that user. Please see Connecting to a sample database. Connections through the internet are initiated by two pieces of information: the host (a computer), and the port. The port is a number used to distinguish multiple network services on the same host. The default Axisbase 1 port number is 3569. To minimize confusion, you should use that port number unless it is already used for another service. Here are the steps to serve a database file on one computer (the server) and then access it from another (the workstation). We assume you already have an Axisbase file that you want to serve. 1. Open the file you intend to serve as a file. Open the database properties window (F7), and select the Users tab. Create the user "super" if it isn't there, and set its password to "super". To do this, choose New Row from the List menu, enter the new row, then choose Commit Changes from the Changes menu. Close the file. 2. Move the file to the server's hard drive. You may want to create a folder such as c:\data to contain database files. 4. Click on "Connect to configuration database..." to open the server configuration. If this is the first time you have opened the file, the factory user name is "super" and the factory password is "super". It will then ask you to change the password to something else. 6. Under "Files to serve", enter a new record for the database file that you copied to the server in step 2. In the List menu, choose New Row, then enter the AxisID and file path like the example shown here. When done entering, choose Commit Changes from the Changes menu. Within a minute after committing the change, the Axisbase server will start serving your database file. 8. Enter the three pieces of information Axisbase needs to connect to the server. The host can be specified in one of several ways. If you are connecting over a local network, you can enter the server's Windows name without any punctuation, such as "SERV1". If you are connecting over the internet, and/or if the server has an internet assigned name, you can enter that, such as "gadgetshop.com". If all else fails and you know a bit about networking, you can enter the IP address of the server, such as "194.23.205.16". The port remains the default value, because we didn't change it in the configuration file. The Axis ID is the Axis ID of the database file you copied to the server in step 2. Press Connect and you should see the login sequence, then (assuming you remembered the password!) you will see your database file just as if you opened it directly as a file. If you need to invoke Axisbase from the Windows command prompt, use this syntax.